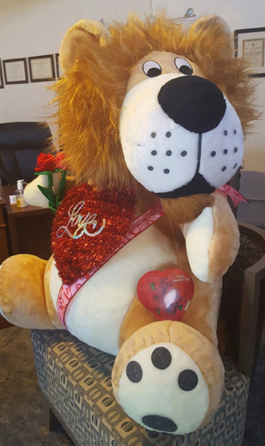 Grammy’s House is selling raffle tickets for a chance to win a giant stuffed lion, Simba the Sweetheart, just in time for Valentine’s Day. Simba originally hails from Knott’s Berry Farm amusement park in California and comes with a box of chocolates, flowers, and his own sash and styled mane! Tickets are $1 and can be purchased at Grammy’s House, 811 W. Texas Ave., or by calling 748-1198. All proceeds go directly to Grammy’s House Artesia Domestic Violence Shelter Inc. Simba will be raffled Friday, Feb. 10. 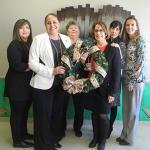 The focus at Grammy’s House is on keeping victims of domestic violence safe as they work to improve their lives. Grammy’s House offers 24-hour domestic shelter services and a wide variety of client programs for adults, teens, and young children — all of them are absolutely free and worth supporting. Grammy’s also accepts donations of items to help their clients who are residing at the domestic violence shelter or moving into a new home: furniture, groceries (gift cards are great), toiletries, cleaning supplies, and clothing for children and adults — please call first to arrange a time to drop off your donations: 748-1198. Goods should be “gently used” and still serviceable — please reserve your paint-stained t-shirt full of holes for the dumpster! Future plans for Grammy’s House include further building renovations, expanded programs, and outreach training. Contact Grammy’s House at 748-1198; Crisis Line: 365-5144; [email protected]; on Facebook: Grammy’s House Artesia Domestic Violence Shelter; on Twitter: grammyshousenm; or by mail, P.O. Box 654, Artesia, N.M. 88211-0654.